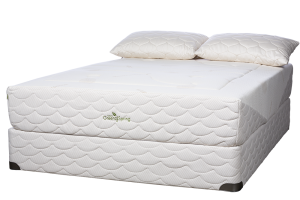 Home → Adjustable Bed Base / Foundation → Natura of Canada Greenspring Ultra Plush Mattress Will Support Heavy Body Weight. I’ve been searching for a new bed for years, but have yet to buy anything because of my husband’s heavy body weight. We’re both of average height. He weighs about 300 lb while I weigh about 150 lb. Anyway, I’m looking for something that will support our combined weight, be comfortable, not be hot, and last a long time. After digging around on the website’s blog entries, it looks like the Natura of Canada Greenspring Ultra Plush mattress would be good. Also, what bed frame would you recommend? I want something that will allow me to attach a headboard. Best buy on bed frames is the “Instamatic” made by Leggett & Platt, which you can find on Amazon. It’s extremely strong and will last you for the rest of your lives. You will be able to attach a headboard to it. Your reading has served you well. The Natura of Canada Greenspring Ultra Plush Mattress is the ideal choice. We have this mattress, at home….with the two of us having the same total body weight as the two of you. We’ve had this mattress for a few years, now. It is, still, in like new condition. The coils are made of double tempered steel and the upholstery is natural Talalay Latex. There is NO Memory Foam in this mattress…which is what causes mattresses to fail quickly. Here is a link to that mattress. You can order online. You’ll delight in the comfort of natural wool, latex and plant-based foam while you enjoy the support of our 5-zoned coil unit.